Participants will identify benefits and barriers to leisure, as well as offer ways to overcome potential barriers. Please see the following points. 1. Take 30 to 50 index cards and write one activity on each of the cards (for example, quilting, gardening, swimming, etc.). 1. Build a square using the 11” tubes and four spheres. Place this on the ground. 2. Attach one 36” tube to each sphere so these tubes point vertically. 3. Connect one sphere to each open end of the 36” tubes, and then connect these with additional 11” tubes to form the three-dimensional base. 4. To create the fan, take one sphere and attach eight 16” tubes. 5. To attach the fan to the base, attach one 24” tube perpendicularly to the center sphere of the fan. Then place this 24” tube on the top right of the base and attach securely with twine (as pictured below). 6. Using eight small pieces of paper, write the word “Barrier” on half of the pieces and “Benefit” on the other half. 7. Attach these pieces of paper with masking tape to every other 11” “blade” of the fan, alternating labels on each tube. 1. Circle up the group. Open with a brief discussion on the benefits of recreation (improving health, being social). Discuss potential barriers that prevent people from participating and ways to adapt to the barriers. 2. Now, read the following Activity Challenge Box to the group.Activity Challenge:Participants will identify benefits and barriers to leisure, as well offer ways to overcome potential barriers. 3. When the group is ready to begin the activity, share the following guidelines for the game. You are on a game show called “Benefits and Barriers!” To play, draw an activity card. Next, spin the Benefits and Barriers Wheel. Depending on where your spin falls, you must give three examples of either benefits or barriers (as well as ways to overcome the barriers) to the activity on your activity card. 4. Explain to participants how to spin the wheel. The tube that stops in alignment with the front vertical support bar of the base is the tube that will indicate whether the team names a benefit or barrier. Example One: Alan draws an activity card for “walking.” He spins and the wheel lands on “Benefits.” Alan answers that “Walking reduces stress, increases health, and gets people outside are three benefits to walking. 6. Allow the participants to play for the time allotted for the activity. 7. If your group is struggling, or if you feel your group would benefit from an additional challenge, present an activity variation. Mark the “fans” with point values and spin to answer trivia questions. 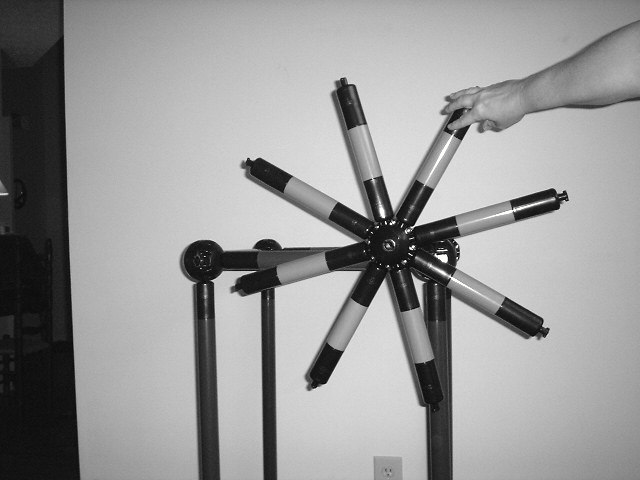 Cognitively-impaired adults who have difficulty relating and responding to the environment may respond to the “wind” created by the spin. 3. Add to other activities.If using an activity such as Pictionary, use the wheel to spin for points before the word is drawn. It adds another element to the game. Have participants spin the wheel and name one positive recreational activity. How did you feel when you heard we were going to “play” on a game show? What did What did you learn today? Why is it important to know the benefits of activities? How does it feel when barriers prevent us from doing activities we want to do? Why is it important to think about leisure? Do you value leisure in your life? not) achieved. Highlight the main contributions and resolve unfinished issues.